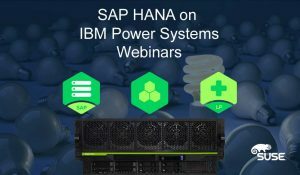 If you’re one of over a thousand customers who’ve implemented SAP HANA on IBM Power Systems over the last couple of years, then you’ve taken a major step toward transforming your business. Maybe you didn’t realize it, but SAP’s strategy going forward is open source and it’s built exclusively on Linux. So when SAP talks about digital transformation of your business operations with SAP S/4HANA, they’re talking about a faster, simpler infrastructure built on SAP HANA. While your SAP NetWeaver applications may be running on AIX today and leveraging the SAP HANA database on Linux, now is the time to start planning your transition to SAP S/4HANA. Learn more about transitioning to SAP S/4HANA here. SUSE Linux Enterprise Server is a preferred and recommended operating system partner for SAP HANA. Roughly 95% of all installations have deployed SUSE Linux Enterprise Server for SAP Applications. That number is 100% of IBM POWER-based servers. Over the last year we’ve introduced enhancements and additional product support specifically for IBM Power Systems. I could list them here, but instead I want to encourage you to check out two upcoming webinars. That way you can hear directly from two technical experts exactly what we’ve done, why we did it and how it works. This webinar is presented by Jay Kruemcke, our very own IBM Champion and Product Manager for SUSE Linux Enterprise Server for POWER. Jay will talk about new capabilities that support high performance, high availability and easier systems management for SAP operations on IBM Power servers. This includes support we’ve added recently for SUSE Manager and SUSE Linux Enterprise Live Patching. Now this one is a “SUSE Standup” which means it gets really technical! Mike Friesenegger is a SUSE Technical Strategist who has extensive experience with IBM Power Systems and with SAP applications. He will go into the details of using SUSE Manager and SUSE Linux Enterprise Live Patching to quickly find and fix non-compliant SAP systems, and those with security risks. This one includes live demonstrations. Go ahead and register even if these times don’t work for you. You’ll get a link for the replay that you can view anytime. Follow me on Twitter at @MichaelDTabron .